In what has somehow become a series, we’re once again reviewing a game published by Adult Swim Games! This publisher has been responsible for some of the most unique and enjoyable games I’ve played recently, and thus when I got the code to give Traverser a try, I was excited, if for no other reason than I’d somehow missed this game’s development, learning about it literally in the email where it was offered. Let’s see how it did! Traverser is a game that, if you’re a fan of good art direction, probably grabs you by the face pretty quickly. There’s a lot of interesting stuff going on in the visuals. 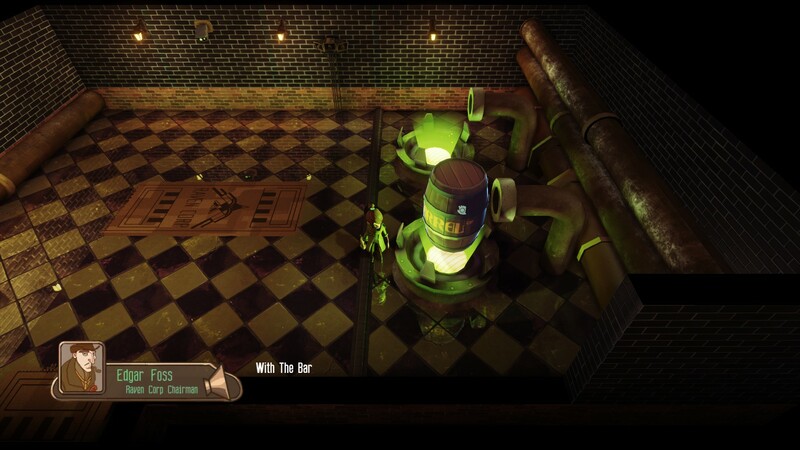 On the surface, it seems like pretty straight steampunk. The buildings and fashion (and accents, though more on that later) are very Victorian/Dickensian England. At the same time, you quickly start seeing things that absolutely don’t jive with that setting. Before long, you’ll see force fields, gravity cloves, automobiles, security cameras… It’s an anachronistic mishmash of technology. Already, that’d make for enough visual intrigue to give the game a hook, but that’s not even the half of it. 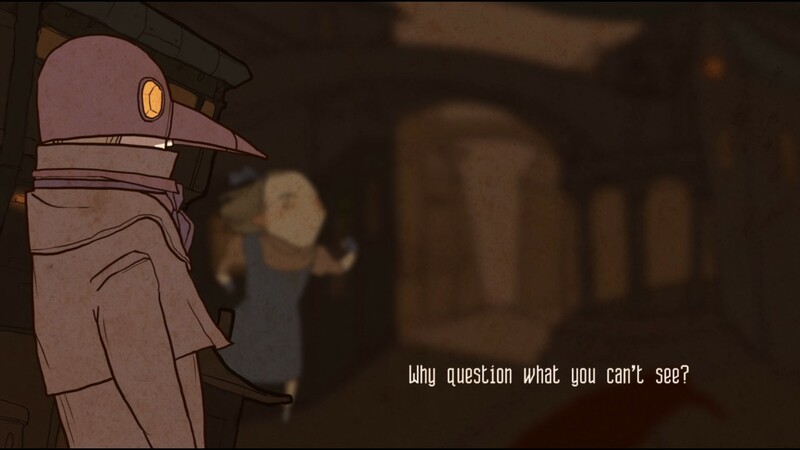 If you were somehow to miss or skip the intro story, told with a unique art style of its own, you’d quickly pick up on the attitude and the personality of the world simply by the way the society has shaped your immediate surroundings. 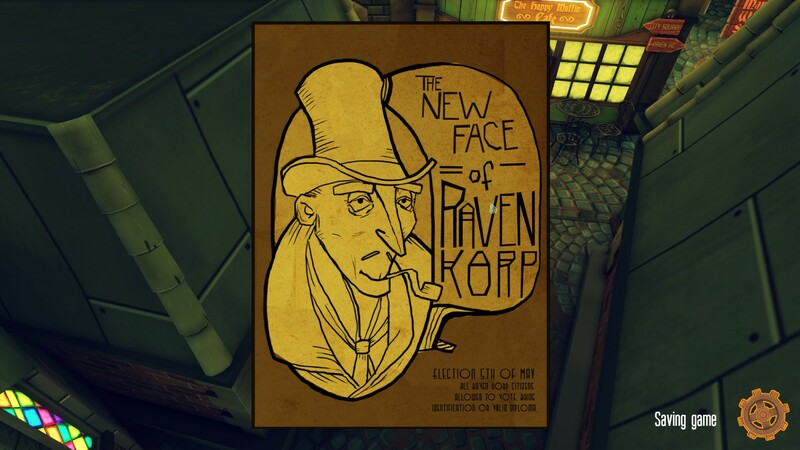 Propaganda style posters hang on the walls with “duck and cover” style warnings and advice, quickly painting a picture of an oppressive, big-brotheresque presence called “The Raven Corporation.” A mascot of sorts, Traverser Freddy, shows up on posters and videos throughout as yet another propaganda tool to control the populace. 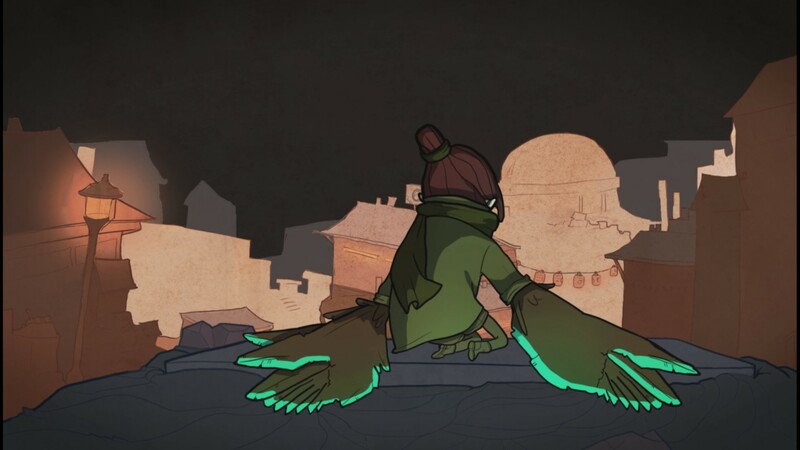 Beak-mask wearing henchmen appear in increasing quantities through the game, and signs of increasing unrest sprinkle in with the progression of the plot. The 3D visuals are, and maybe I overuse this term, stylized. They match the 2D style well, and maintain the unique visual attitude nicely. There’s a good amount of variety of things to look at, though at times the game feels a little cramped. It’s worth pointing out that the setting, which one could easily imagine in foggy, rainy London, takes place underground in a city that is actually two cities on flip sides of a piece of rock floating in a volcanic chamber. One complaint I had with the visual representation of the game is the fact that the camera cannot be rotated. This means you’ll have no simple way of knowing what is around the corner, and when something is blocking your vision, the only way to see behind it is to move until it entirely hides you, at which point it will fade to invisibility. Games have long ago taught us to manipulate the camera to peer around corners and look at what dangers lurk ahead, so not being able to do so here was frustrating. If I had to boil Traverser down into a single game type, I suppose I’d call it a physics puzzle game, but it tries to heap a few extra mechanics on top of that with varying levels of success. In terms of controls, you begin with the ability to run, jump, sneak, and interact. Before long you’re given a gravity glove that lets you move objects with the mouse. There’s nothing terribly new about this as a mechanic, but I’ll admit they give you fairly precise control of the physical manipulation. Once you pick something up, not only can you drag it around, you can raise it, lower it, and rotate it on two axes. Most of the puzzles in the game involve moving things around with these, either to stack boxes to climb to higher areas, test to see if the ground is safe, manipulate a balance scale, etc. Some basic combat is achieved by smacking things with boxes, and the introduction of missiles and dynamite to smash things with helps immensely to improve things like boss fights. And yes, despite a largely puzzle based game, you do regularly have to use your glove to do battle with a boss. Each has a puzzle aspect to it, but mostly of the difficulty will come from the manipulation of the physics objects and the general platforming. I’ll be honest, I wasn’t overly impressed with the platforming in this game. Your character moves very slowly, and slower still when sneaking. You don’t have any sort of double jump or edge-grab mechanic available to you, and quite frequently a jump you think is high enough is just barely too low for your feet to connect with the new platform, and you end up falling again. At best this costs you time, at worst it can alert the guards in the game and send you running around like a dope trying to lose them. If there is another primary aspect to the game, it is the stealth aspect. You have a sneak button which slows you down and allows you to move past guards undetected if you are outside of their ill-defined field of view. On rare occasion you’ll also have access to the marvelous “BARREL” technology, which is sort of a mobile disguise and protection from lasers. I wasn’t a fan of that whole aspect, since you were already slow enough before you started sneaking, and the motion of both security cameras and guards could be terribly erratic. Coupled with the relative ease of escape, I ended up plowing through stealth sections like a bull in a china shop with little consequence. Here and there I was bugged by the sometimes few and far between checkpoints, but I think the most irritating part of the game was its length. I reached the conclusion in three hours even. If you’re a fan of short, sweet games, this one is probably satisfying, but with the depth of the setting, I feel like a polished, sprawling game like Wind Waker would have been more called for. It feels like overall the gameplay was comparatively thin compared to the world and world building. The voice work in the game is above average, I’d say. You’ll hear just about every 1800’s English stereotype accent if you wait long enough, each rendered with reasonable care. Your protagonist is (nearly) mute, so lines will mostly imply she’s said something you weren’t privy to. The music was good to, setting the mood properly. No complaints here. On its own, Traverser would have been a decent indie title that errs on the side of art and comes up a little thin on gameplay. That’s forgivable, and I don’t regret playing the game. 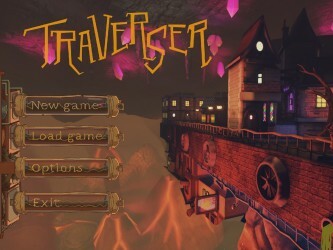 But with the murderer’s row of indie titles that Adult Swim Games has been putting out, Traverser suffers from being the average game in an above average lineup. 7.1 / 10: A fine setting with decent mechanics, but a short length and slight lack of polish causes Traverser to fall short of my initially high expectations. 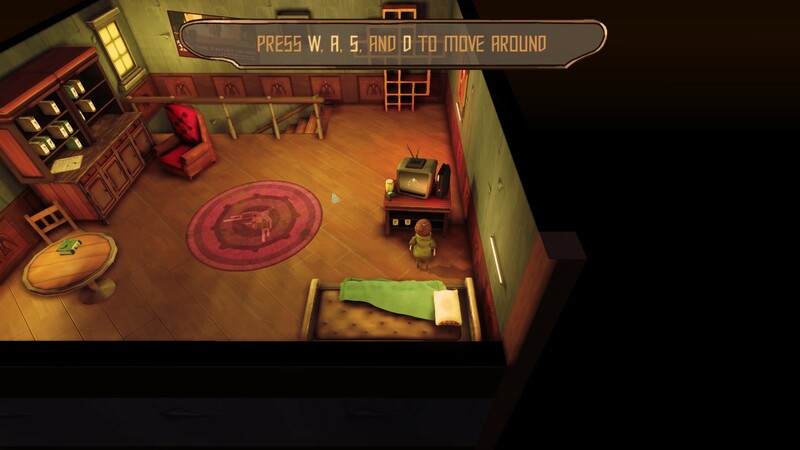 how come there is a rotate camera setting in the controls ?